Interruption of blood flow to the brain can result in lasting damage within seconds, and “brain death” can occur within minutes. Unless blood flow is restored quickly, a series of progressive and irreversible mechanisms are thought to ultimately led to cell death and decomposition of the brain. The growing consensus has been that brain decomposition happens within a singular, narrowly defined time period after blood flow to the brain has stopped. But death of brain cells may occur in a much more gradual way than previously thought. This week in Nature, Vrselja and colleagues use a newly-developed device to demonstrate that cellular function and circulation can be successfully restored to the mammalian brain up to four hours after death. The authors developed a device called BrainEx, which allows them to remove a brain 4 hours after death and flush it continuously (also called perfusion) for 6 hours with a blood-like fluid that promotes recovery from lack of oxygen, prevents excess liquid accumulation, and provides the brain with the energy it needs to function on a cellular level. The researchers tested this device on brains of 6-8-month-old pigs from USDA-regulated food processing facilities. 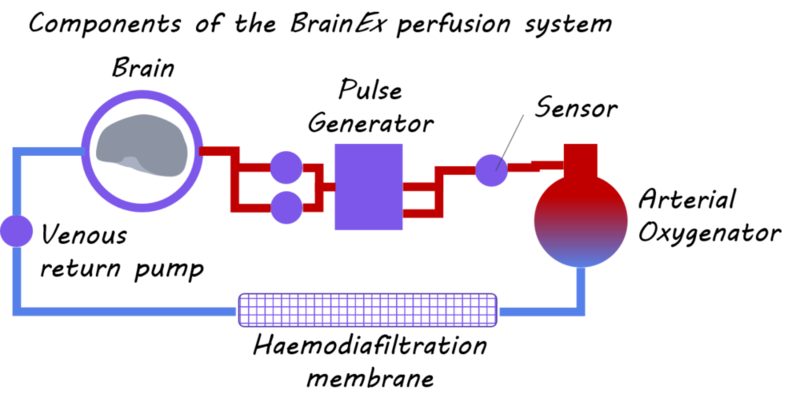 The researchers developed four conditions to compare with the BrainEx and the blood-like fluid: 1) perfusion with a control fluid; 2) perfusion with the specially designed blood-like fluid; 3) no perfusion and kept at room temperature for a total of 10 hours (the total interval of all brains after death – 4 hours after death plus 6 hours of perfusion) and 4) processed 1 hour after death with no perfusion. The authors then quantified circulatory and cellular health of the brain by measuring flow dynamics throughout the brains, relative size of neural landmarks, and integrity and functional properties of different cell types throughout the brain, including excitatory, inhibitory, and glial cells. The authors also investigated whether brains could mount immune responses by injecting brains with lipopolysaccharide (an agent that induces an immune response) and measuring inflammatory responses. Finally, the authors measured energy metabolism and electrical activity to determine whether their device could restore metabolic and electrophysiological activity across the whole brain. Overall, the researchers found that perfusion with blood-like fluid through the BrainEx device can restore and maintain circulation and cellular life to brains that have been “dead” for four hours. Compared to control groups, the authors observed that brains perfused with the blood-like fluid showed decreases in cell death and preserved neuroanatomical and cellular integrity. Vasculature and glia were also responsive to an agent known to cause immune responses in the brain, indicating a restoration of cellular function. The authors also observed spontaneous synaptic activity and active metabolism. It should be noted that while cellular function was restored, it should not be interpreted that normal brain function was restored. Global electrical activity and integrated brain function associated with awareness, perception, and other higher-order function was not observed. This is the first study to demonstrate that degradation of the brain after death is a much larger grey area than previously thought. Instead of rapid degradation within a short time after death, this study reveals that the brain undergoes a prolonged period of degradation. Further, it demonstrates that BrainEx perfusion with blood-like fluid up to four hours after death can restore cellular and circulatory function. This technology presents the exciting possibility of investigating how the brain recovers from large insults like oxygen and blood-flow deprivation. Vrselja et al., Restoration of brain circulation and cellular functions hours post-mortem, Nature (2019). Access the original scientific publication here. Some individuals are more susceptible to developing a dependence to nicotine than others. Identifying biomarkers that distinguish individuals at risk for developing addictions could inform treatment plans and preventative measures. This week in the Journal of Neuroscience, Hsu & Keeley and colleagues characterized a potential biomarker for risk of nicotine addiction. The authors administered nicotine to 10 rats for two weeks and used neuroimaging (functional magnetic resonance imaging; fMRI) to look for biomarkers that distinguished rats that became dependent on nicotine from rats that did not. To characterize dependence on nicotine, the authors looked for a cluster of common behaviors characteristic of nicotine withdrawal, including teeth chattering, gasping, body shakes, yawns, and escape attempts. They checked for the behavioral symptoms before administering nicotine, at one day and again at two weeks after stopping the administration of nicotine. Rats were observed for 50 minutes, and assigned a score depending on the number of behaviors they exhibited. To assess whether brain activity could predict nicotine dependence and withdrawal, the authors analyzed the relationship between functional connectivity between different brain regions on day 1 (the “drug naïve” brain) and dependence behavioral scores. To measure functional connectivity the authors calculated correlations between the signal fluctuations in different brain regions while the rats were lightly anesthetized in the MRI scanner. Analysis resulted in a matrix defining the strength of the correlation between each brain region with every other brain region (“functional connectivity”). The authors then used a graph theory framework (modularity analysis) to define 5 brain modules (groups of brain regions that are similarly connected) as well as several sub-modules. After identifying modules in the brain, they assessed the strength of connections within modules and between modules, as well as the relationship between connectivity strength and drug dependence and reversal. The authors found that functional connectivity between modules (inter-module connectivity) measured before rats were exposed to nicotine could predict the severity of nicotine dependence. Connectivity between a specific module, the insular-frontal module and the 4 other modules before nicotine exposure predicted dependence severity and abstinence-induced reversal. Specifically, stronger connections between the insular-frontal module and other modules was correlated with greater dependence severity. Weaker connections between the insular-frontal module and other modules was correlated with enhanced dependence reversal after abstinence from nicotine. Intra-module connectivity, in contrast, did not predict dependence severity. The authors further subdivided the insular-frontal module into three sub-modules and found that (1) the inter-module connectivity of all three submodules predicted dependence on nicotine and (2) the inter-module connectivity of two of the three submodules --the insula and frontal-motor submodules--predicted dependence reversal after two weeks of nicotine abstinence. These results suggest that intrinsic insular-frontal circuits could be used as biomarkers of nicotine dependence risk. This is the first study to identify patterns of connectivity that can predict future risk of nicotine dependence. The authors identified an insular-frontal cortical biomarker of nicotine dependence risk. The biomarker has the potential to identify individuals at risk for developing dependence, as well as individuals likely to recover after a period of abstinence. Hsu, L-M. Keeley, R.J., et al. Intrinsic Insular-Frontal Networks Predict Future Nicotine Dependence Severity. Journal of Neuroscience (2019). Access the original scientific publication here. In recent years, sleep has been increasingly recognized as an important regulator of a myriad of biological processes, including memory performance, food valuation, and resting cerebral blood flow (see previous BrainPosts). As it turns out, emotional health may also be regulated by sleep, though the molecular, cellular, and circuit mechanisms responsible have been difficult to pin down. This week in Molecular Psychiatry, Ge and colleagues show that the baseline firing rate of cholinergic neurons (ChNs) within the medial habenula complex (a brain region involved in signalling reward prediction and errors in reward prediction), is increased after chronic sleep disruption. To model chronic sleep disruption in mice, the authors carried out a protocol of sleep fragmentation, a procedure designed to specifically disrupt REM sleep in rodents. SF animals were housed in custom-made treadmill boxes for 5 days: while the floor of the animal's cage consisted of a layer of steel mesh, timed rotating of a treadmill belt caused a cylindrical object underneath the mesh layer to roll back-and-forth along the length of the cage, preventing the mouse from sleeping uninterrupted. In a control group of mice, no treadmill was present. Sleeping behavior was monitored for a portion of the animals by surgically implanting EEG/EMG electrodes and decoding neural activity into 3 broad categories: wakefulness, REM sleep, and NREM sleep. Following sacrifice of the animals, electrophysiology was used to record activity of cholinergic neurons (ChNs) in brain slices containing the medial habenula complex; various ion channel- and neurotransmitter receptor-modifying reagents were added to the bath solution to test the resulting effects on ChN activity. Finally, immunohistochemical and in situ hybridization techniques were employed to label cholinergic neurons and TASK-3, a potassium channel important for modulating neuronal activity. EEG/EMG recordings showed that animals who experienced sleep fragmentation exhibited significant decreases in average duration of REM sleep episodes during the 5-day protocol, compared to control mice. Electrophysiological recording showed augmented baseline firing rate of ChNs in the medial habenula complex of REM sleep-disrupted animals. This is significant because the activity of medial habenula ChNs has been previously linked to a number of affect-related behaviors, including stress and drug-relapse. Application of various neurotransmitter-modifying reagents failed to produce any changes in baseline ChN activity in both the SF and control groups, indicating that sleep-induced alterations in ChN activity are not mediated by synaptic transmission. However, group differences in baseline ChN activity were observed upon application of a TASK-3 antagonist. First, while depolarization of the resting membrane potential was seen in the control group following addition of the antagonist, no changes in resting membrane potential were recorded in mice who experienced sleep fragmentation. Second, application of the TASK-3 antagonist led to an increase in firing rate in the control group, but not the fragmented sleep group. Finally, the increase in firing rate observed in the control group was accompanied by a significant increase in firing regularity (measured as the coefficient of variation of firing interval), which was also not observed in the fragmented sleep group. Taken together, these findings suggest that TASK-3 potassium channels are compromised following sleep fragmentation, leading to alterations in baseline ChN activity in the medial habenula. This is the first study to investigate the effects of sleep disruption on medial habenula ChN activity. Though additional studies are needed to determine exactly how TASK-3 potassium channels are targeted by sleep fragmentation, these findings are strongly indicative of a direct mechanism linking sleep and emotion regulation. Ge et al. Chronic sleep fragmentation enhances habenula cholinergic neural activity. Molecular Psychiatry (2019). Access the original scientific publication here.